Conferences happen all year long, but how effective are they? Can you meet with the Speakers to ask them specific questions in person? Network at certain times with like-minded attendees? That is what sets The Bitcoinference Europe Conference apart. This event will run at the Proximus Lounge in Brussels (Evere) on June 1st, 2018. Doors will open at 8:30 am with a networking breakfast. Speakers and High Potential Startups begin at 10 am. Speakers will cover topics from Financial Impact, Banking, Investment, Application, and the Politics of Blockchain Technology. The event concludes at 6:30 pm with an after party. There is a pre-event VIP dinner, hosted by the US firm Block 5 Capital, at a famous Belgian restaurant on May 31st. Get a head start with the movers and shakers in the Cryptocurrency World during this intimate gathering. Seating is limited, so contact us for details. Bitcoinference Europe will host 25 Startups, 6 of which will publicly present onstage. The Block 5 Investment room is where you can interact with Investors, Advisors, the Startup Presenters, and Venture Capitalists. Meet them here and let the magic happen. Speakers include well-known leaders in the field, CEOs, Investment and Banking Experts, Vloggers, Political Specialists, and Philosophers. The Startups cover the range of applications and subjects. All attendees are welcome, from the curious Newbie to the seasoned Investor and Advisor. This years Platinum sponsors at The Bitcoinference are Shopin and Tobania. Shopin is the world’s first decentralized shopper profile built on the blockchain. Shopin is creating a more sustainable retail economy where retailers become stronger by working together and where shoppers get rewarded based on the value of their data that they fully own, control, and can share. LeadingBelgian firm Tobania to provide complete Digital Transformation for businesses by providing the IT & Business experts, solutions, and software needed to navigate the Fourth Industrial Revolution. The Bitcoinference was created due to the surge of interest in Cryptocurrencies and will be donating 10% of the profits to a good ‘Blockchain’ Charity. 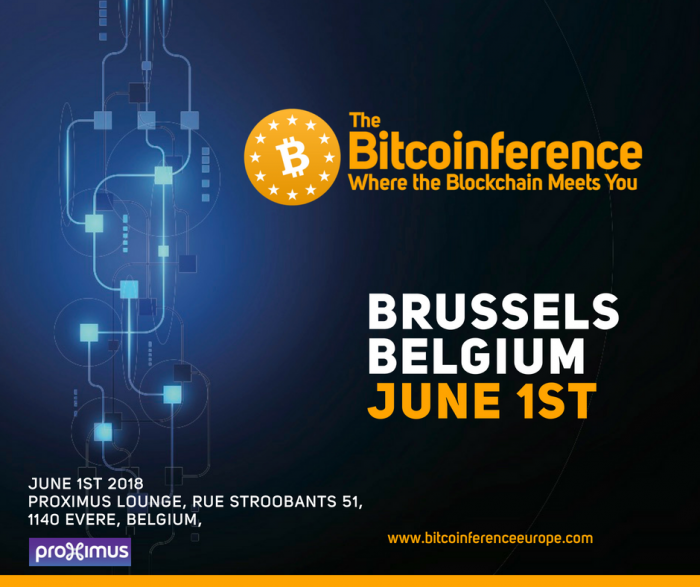 Book your Bitcoinference Europe tickets online at www.bitcoinferenceurope.com; prices start at 199 Euro. The Conference After Party features DJ Wout from Tomorrowland. Doors open at 6.30pm for the After Party. Tickets for the After Party plus networking are available on the website and costs €149. Attendance at the Conference automatically gives you entrance to the After Party and is included in the cost of the Conference ticket. If you are unable to attend the event there will be a Livestream of the event also on the day and tickets cost €49.